I-66 bus funded by NVTC by Fairfax Connector. Another $20 million in transit improvement projects will be heading our way in the fall, paid for by money generated by tolling on I-66 between Fairfax County and DC. Local jurisdictions submitted $32.8 million worth of projects, but only the top few are able to be funded. The public comment period is open, so you can voice your opinion now. 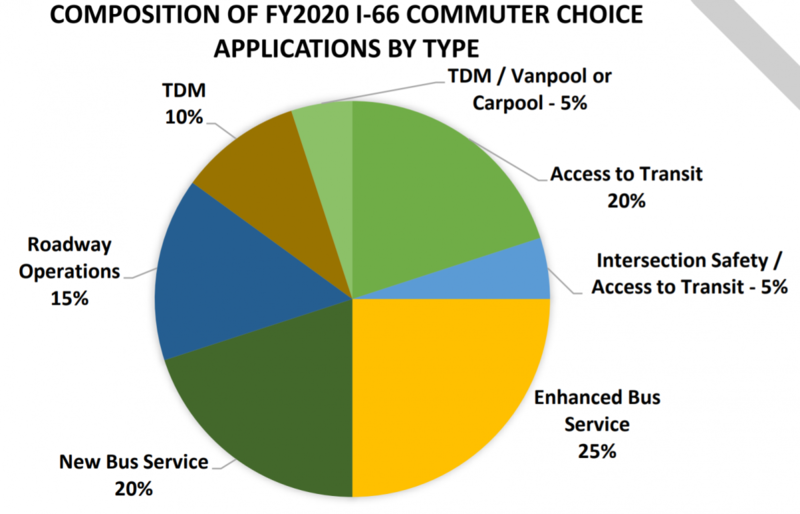 The Commuter Choice program has already awarded funding to 20 projects, according to NVTC. These include the Fairfax Connector 699 express bus from Fairfax to DC and the OmniRide express bus from Gainesville to the Pentagon. Scoring a 95 out of 100, a project submitted by Arlington would increase rush hour frequencies on the Metrobus 3Y route from East Falls Church to Farragut Square. The other project to score a 95 out of 100, submitted by Fairfax, would add three morning and three evening trips to the 699 express route which runs between the Fairfax County Government Center and 19th/F St NW. Following up in third with 94 out of 100 is a Loudoun project to add two additional morning and evening trips to the express bus running between Stone Ridge Park and Ride southwest of Dulles Airport to the State Department downtown. More and more projects have been funded over the few years the Commuter Choice program has been in existence. Just over $12 million of projects were approved in the FY 2018 cycle, and $9.8 million were approved the year before. A project submitted for funding by Arlington—building a peak-period bus/HOV-only lane on Lee Highway through Rosslyn—could be the highest-scored project not to receive funding in this round. By restriping lanes and adding new signage, Arlington said it could speed the travel of “up to 25 Arlington Transit (ART), Metrobus, and Loudoun County Transit buses per hour” with the new lane configuration from North Kenmore Street to North Lynn Street (1.8 miles). NVTC also opened the submission period for jurisdictions along the I-395/I-95 corridor from Spotsylvania County up to Arlington to submit projects for the I-395 Commuter Choice program. $15 million for those projects is expected to be awarded sometime in early October in anticipation of I-395 toll lanes going live on “Toll Day 1” in late October 2019. The public comment period is open through May 15. If you are at the Van Ness Metrorail station and head south on the Red Line, what is the next station you will reach? Feel free to ignore station subtitles.